On the screen to the left, some of the footage is in black and white; some of it is in colour. Some of it is grainy and indistinct; some of it is relatively clear. All of it suggests times, crafts, lifestyles, and even a country long gone. On the screen to the right, the images are sharp and clean, brand new, confounding the notion of demise, affirming survival and health: in a different form, of course, but alive and kicking nonetheless. This exhibition has come about through a partnership between the R-Space Gallery, in Lisburn, and Northern Ireland Screen’s Digital Film Archive. The idea is this: take six artist-makers working in traditional crafts in the country today, and sit them down to watch film from the archive of crafts people from Northern Ireland’s past, and then let them respond to what they see. The films made of the contemporary makers, along with the pieces they produced, are on display in one room of the Nerve Visual Gallery. It’s a clever idea to keep them all in one room, because the effect they create is that way kept intense and entire. And the impact is instant, just stepping through the doorway, without even looking at anything up close. This is a room of rich textures, modest colours, and true materials. And there’s a smell, too, faint but definite, of wood and wool, and stone. Honesty, beauty, patience, respect, and a sense of hand and eye – they’re all here. The six makers featured are Alison Fitzgerald, Nicola Gates, Ronan Lowery, Sharon Adams, Sheena Devitt, and Peter Surginor, workers in wool, wood, stone, porcelain, willow. The pieces they have produced, and the processes they have followed, are passionate and reserved, with a dash of serious playfulness, and they push against the limits of the materials, testing their possibilities, attentive to boundaries. One of the most striking displays is by Peter Surginor. 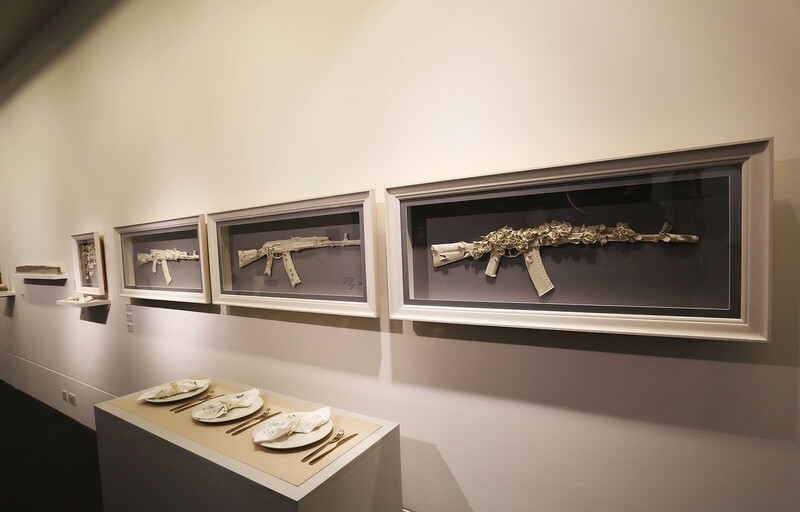 He presents a display of delicate porcelain blooms, next to three automatic rifles in porcelain, decorated in flowers, stems, twining branches, and delicate filigree lace around the barrels. Craft, manufacture, and political history meet and combine. The flowers don’t disguise or take over – they just decorate nicely and politely. Sharon Adams’ work focuses on the tools used by labourers in the field and on the farm. She has fashioned obsolete tools using wood and metal, and they are shown out of context, so their original uses become less important than their graceful, sculptural qualities, although those original purposes are never forgotten, and nor are the hands that worked them. Against the wall at the far end of the gallery is Alison Fitzgerald’s work. She works in willow, producing baskets. We are shown the thin bundles of willow branches standing against the white wall, lining up from left to right like a family arranged according to height. And there, also, are the base boards into which the willows are placed to create a frame round which other branches are wound. There’s a sense of sculpture here, as in other works, but mainly the impression is one of function and purpose. Nicola Gates is a textile maker and artist. Watching the archive film, she was struck particularly by the dry stone walls shown being built in the Mournes. The samples and rugs she has produced here are intended to recall their construction, in their stylised designs and their muted colours. The work is connected and rooted; there’s an impression of belonging, being part of something. I particularly love the work by Sheena Devitt and Ronan Lowery. Deviit is a sculptor working with stone and slate. She talks of her home close to Strangford Lough, and her consciousness of tides that push in from the sea. Following her process of creation, we see her paintings of wave patterns, in beautiful blues, followed by the most gorgeous strip of sandstone, quarried by a firm in Kilkeel. Long and slender, the top of the stone ripples gently, while the side, cold and surprisingly soft, is smooth and clean. It is reserved, shy almost, and seems both fabricated and utterly natural. Lowery is a furniture maker. There are two contrasting pieces of his on display here, one, to my mind, especially beautiful. First there is a chair, with a curved back, recalling the bodhran makers, and modern, rectangular, fiercely right-angled seat, marked with story-telling images. And then there’s a long, low, sharp bench, the outer wood of which is scorched, bringing out the grain and identity of the wood, while, within the frame, is a sinewy spiral of wood, suggesting a flow and movement against the solidity of the piece. This is an exhibition of enormous interest and beauty. It is tactile, but not just in the feel of the pieces on display. It’s an exhibition that reaches towards and then touches and caresses the past. It listens to the past too, and then talks to the future, and those who may look back at the films produced following these six artist-makers. The Film | Makers exhibition remains at the Nerve Visual Gallery in Ebrington, Derry~Londonderry and is free to visit until Sunday, March 4. The gallery is open from 10am-5pm Tuesday-Saturday and 11am-4pm on Sundays.